Price action on the 15 minutes chart looks like a triangle pattern is unfolding in most likely a b of b position, although it can also be a bearish triangle in a lesser degree. Open test is needed to determine its position. Later on I'll post an illustration about this. I closed my position on my cellphone at 11843. I'm done with trading for today. Have a good weekend everyone! Channel must break for a bigger downside movement. I got leave for a meeting and I won't be able to follow the position. I put a trainling stop on the position. I'm gonna try to play out a short scenario. I decided to close the position at 11900. I think the market will test today's high, but at least the 11930 level. Opened a long. I expect at least a wave B to be carried out. SL is already raised to 11870 and I scaled the position at 11890. Channel drawn on the 5 minutes chart might decide the direction of the next wave. So far the drop is contained by a parallel channel. Upside break out would suggest at least a correction to the level of 11900s. I plan to open a long if the channel gets tested. I didn't wait for the TP and closed the short at 11817. The position reached 2R. Back on the short side for one last time. So far my balance is negative for the day, and I don't want to burn anymore of this week's profit. If this position gets closed in a loss, I will go away from the market at least until the U.S. opening. Another mistake would show me that I can't see the market well at moment. It was a bad decision to open a long position and I got my punishment for that. I decided to step back and closed my position at the bottom line of a channel on the 1 minute chart. I'm gonna reenter if new local low will occur. Position got stop out. I blew this trade, but I'm gonna seek reentry on the short side if there is an opportunity. Break even. 1 hour candle looks like it's going to be a reversal one. Even if this is not going to be an impulse wave on the 5 minutes chart, I think the 11850 level is reachable from here. Lowered my SL to 11890. So far the drop on the1 minute chart looks like a correction. Position got stop out. A new high would suggest a continuation of the rally, while a break of 11880 would make a bearish bias. Short position opened at 11904. 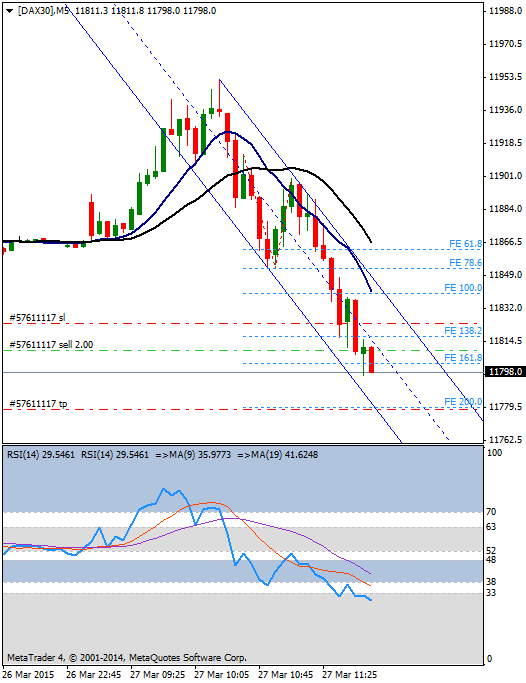 SL already lowered to 11911. 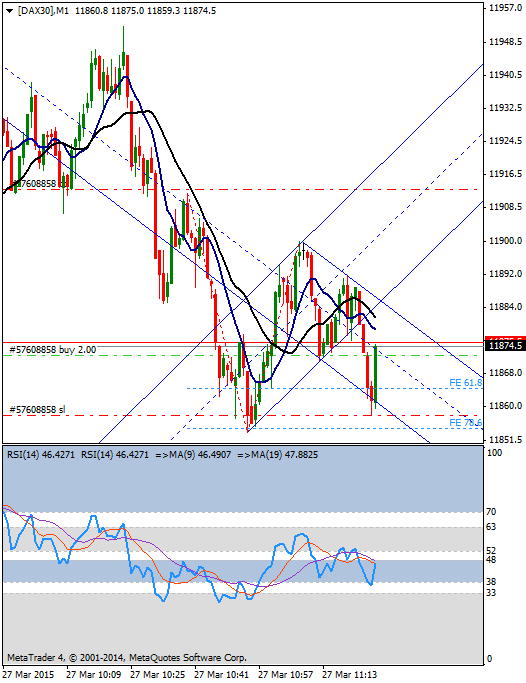 Tp modified to 11860. I also put a trailing stop on it. For a temporary top to be in place the market needs to make a reversal candle on the 5 and 15 minutes chart and then a break of the Elliott channel drawn on the 15 minutes chart. I plan to scalp today and I think my first trade will be a short. 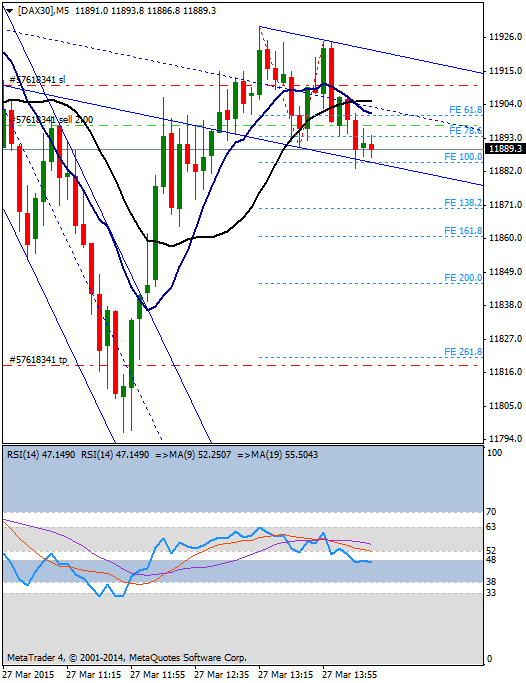 Ideal target zone would be the support provided by a triangle (m15) around 11850. Now I'm gonna wait for a setup. MA10/20 channel on the 15 minutes chart supported the upside movement nicely. Ideal fibonacci expansion levels have been reached. A smaller degree impulse wave may be building a temporary top.